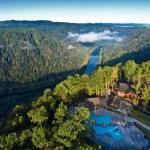 Located in Fayetteville Adventures on the Gorge offers 3-star accommodation with barbecue facilities. Offering a restaurant the property also features a garden and a bar. Free WiFi is available. At the resort every room is equipped with a desk and a flat-screen TV. Every room comes with a private bathroom with a bath or shower free toiletries and a hair dryer. All rooms at Adventures on the Gorge feature air conditioning and a wardrobe. The accommodation offers a children's playground. A variety of popular activities are available in the area around Adventures on the Gorge including cycling and hiking. Beckley is 36 km from the resort. The nearest airport is Yeager Airport 55 km from the property.